I was surprised by all the bright colors in the cottage. The cottage has one bedroom and sleeps two. However, “babes in arms and one small, well-behaved dog” are welcome, too. 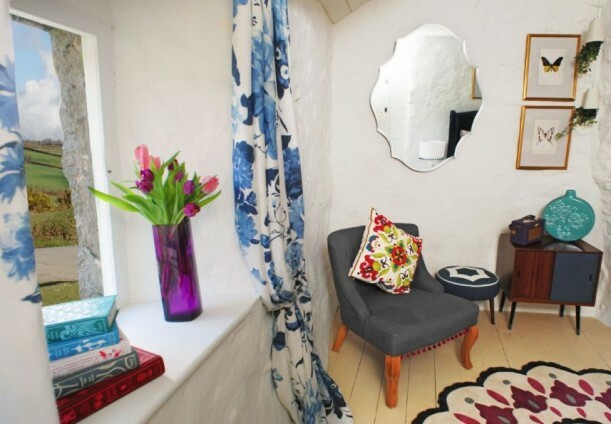 For more photos and details about renting Teacup cottage on your next holiday, visit Unique Home Stays, one of my favorite websites for daydreaming. Toured a tiny Cotswolds cottage garden, asked the middle-aged couple who owned it how their marriage survived the tiny space. They laughed and asked, “Why do you think we garden?!”. Love, love LOVE Teacup cottage! – I featured it a couple months ago on my blog. It’s just dreamy! The decor is perfection. Did you really? I love it, too! Too adorable! 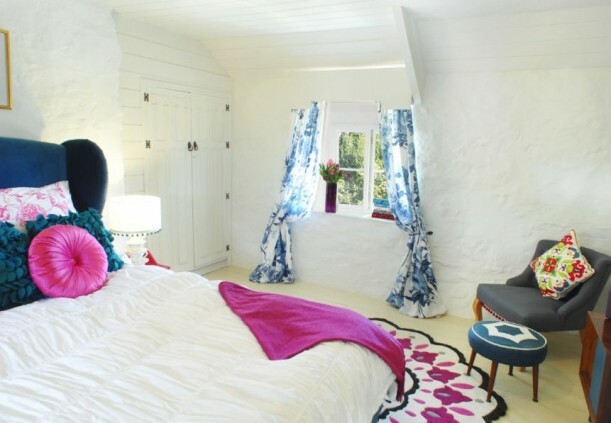 Quintessential English cottage with a colorful, fun vibe. Love it. 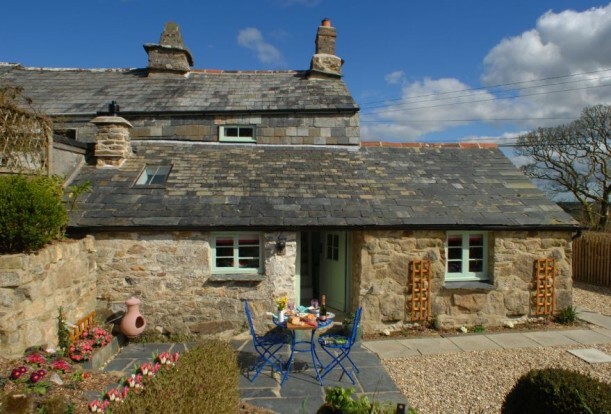 Teacup cottage is absolutely charming! Thanks so much for the tour! Just read some of your older real estate listing posts, thanks for the laughs. I just google map this …its in the middle of nowhere ! but its still a cute cottage ! Very cute. Sorry I hate to be negative, but……I love white, but this is SOOOO much white I would feel like I was staying in a cave carved from lime. They could have at least left the ceiling beams natural wood to warm it up. And maybe painted the ceiling some sort of blue. The curb appeal is really cool though. What a charming cottage! It’s pocket size but enormous in style and colour. Ideal hideaway for two people wanting to get away from it all. I can imagine spending a few days there. I certainly would love to spend some time there! This is such a cute cottage, makes me miss home. Oh my. I am confused. Perfect & lovely on the outside. Beautiful features on the inside. I’m struggling with the decor because it overpowers the cute structure. Furniture & decor look cheap. I’m hoping it all comes together better in person. When can I move in permanently????? 😀 LOVE this little cottage. Trip’s family is from Cornwall (Treleaven is a Cornish name)…..Methinks we’re long overdue for a visit! The English often use the expression “cheap and cheerful,” Not sure if the emphasis in this case is on the cheap or on the cheerful, I am on the fence about all the bright colors and the sitting area rug, coffee table and the kitchen back splash just look cheap to me and not particularly cheerful. Still, I love cottages (my favorite kind of house!) and I always get excited when you have one to share with us, thanks! Looks like a solid property, love the interior walls. The hand delivered breakfast is a must have. My brother used to rent out a condo he owned on a golf course. You have no idea how much people steal and damage. If the decorations seem cheap, maybe they are, because if they are authentic and lovely, they do not stay. Good point! You would definitely have to take things like that into consideration when you’re renting. Love the exterior, but the Ikea furnishings would have me looking elsewhere. When I stay in place like that I want to sink into the shabby gentility of Jane Austen, not Barbie and Ken. Does it have the low low ceilings and doorways that make you duck your head when entering? Do you have to tilt your head sideways while indoors if you’re over 5 ft 8″ tall? I’ve been in these “cottages” and they make me feel like I am squeezing into a doll house! 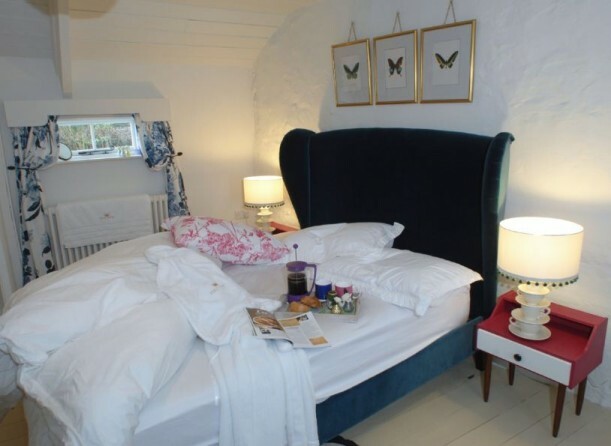 Having another look at this, and I just noticed the lamp bases in the bedroom are made out of cups and saucers!